Hi. My name is Olivier. Visitors or sponsors, welcome to my site. You are here for some serious stories of ice sailing in 2017 and to witness our preparations for a Nord West Passage from Est to West in the summer of 2018. This is the story of one of a kind boat…..
and my experience of the craftmanship as a shipwright. I combined that with 10 years of sailing experiences . At that time, I was voyaging with my former boat “Breur Bihan” . which I drew and built myself when I was 19 years old. She was made of four layers of mahogany cold molded glued with “Resorsinol”. Breskell is a much bigger boat. A real and confortable passagemaker. On the outside, layers of fiberglass clothes with epoxy cover protect the wood against abrasion. Breskell is built of one layer of “ Niangon “ mahogany strip planking and 2 layer of “ grand Bassam” Mahogany 5m/m each, crossed at 45 degrees diagonal and cold molded with West System Epoxy. In June 1986, Breskell was launched for the first time. Breskell has a center board allowing her to go in shallow water, up to 4 feet, like the Chesapeake bay or the intra coastal waterway. But its 10’ down centerboard makes her a very seaworthy boat and comfortable at sea. She is also built with twin rudders angled at 15 degrees. This specific design allows her to keep a strait course when sailing fast on the open sea. Then we improved it during our Virginia stay. and added some nice features. Do you like this personalized epoxy made wheel ? It worked perfectly with my windvane during a long crossing. , one, my wife from New York to France via the Azores, the last one, single-handed, up to Chesapeake bay via St Thomas, US Virgin Islands. Here is a nice remembering of my solitary Atlantic crossing. 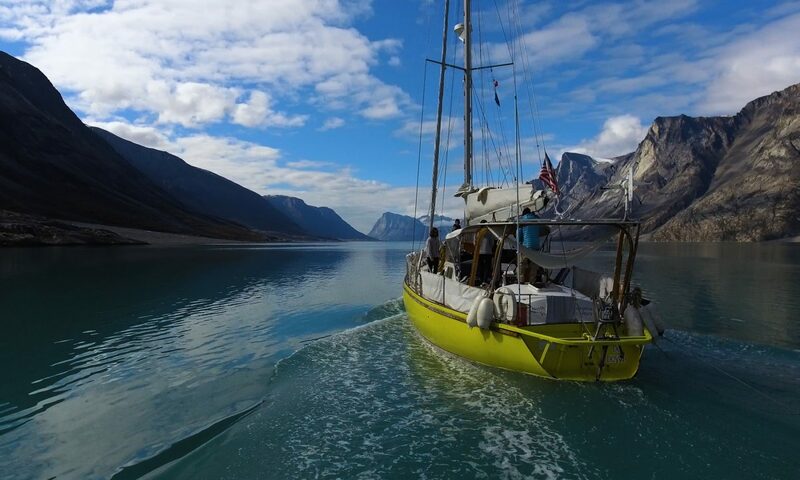 In the summer of 2017, I sailed Breskell to the Arctic via St John Newfoundland and up to Disko bay. THE FAMOUS NORTH WEST PASSAGE!!! 1- I have some opportunities left for participants during my 17 to 28 July 2018 sailing between llulissat and Upernavik.